Superdry women’s Arctic hooded print Pop Zip SD-Windcheater jacket. This essential outdoor jacket is from the Superdry Wind Family and features a fleece lining throughout and a bungee cord adjustable hood and hem. This Windcheater also has a triple layer zip complete with coloured middle teeth, an elasticated inner collar and cuffs with thumb holes. 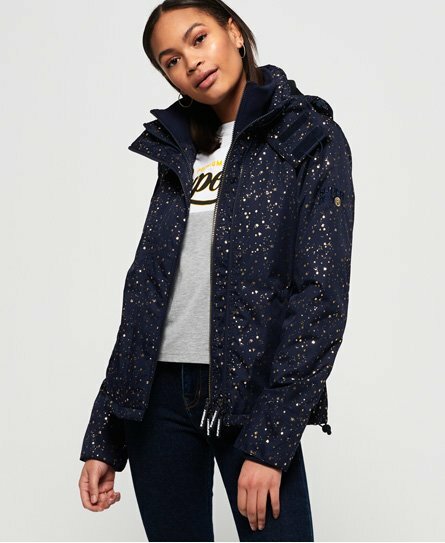 The Arctic hooded print Pop Zip Windcheater jacket has two front zipped pockets and one inner pocket with a popper fastening for added practicality. The jacket is finished with an all-over print, embroidered Superdry logos on the back and sleeve, and a rubberised Superdry logo badge on the right sleeve.